So the starting point is an e-pub file. My strong advice is to make this e-pub with the KINDLE metadata embedded within it. (So, for example, use the Kindle ISBN and specify a ‘format’ of ‘mobi’ in the metadata.) I like to put a copy of the back cover of the book at the end of my e-books, complete with a barcode appropriate to the e-book. If you wanted to do the same, you would want to make sure that the back cover has the barcode for the kindle on it. Also make sure that the title-page verso (copyright page) has the kindle ISBN and other information on it. It might seem crazy to be making an e-pub with the KINDLE data embedded in it, but this is going to be converted to a kindle, so it makes sense. The index at the bottom of this post has links to all my posts on making an e-pub, roughly in the order in which you would need to read them if you were creating an e-book from scratch for the first time. Once your epub is finished and has passed epubcheck, you will need to make a few adjustments to it for kindle. See my six early posts linked in the next two paragraphs for the details. YOU ARE NOW FINISHED WITH SIGIL. From this point on, ANY changes to your e-book will need to be made with an html editor, such as Komodo Edit. This now gets complicated, so be methodical. Start with a new folder with your epub in it. Now make a copy of the epub and save it somewhere safe and make sure the folder it is in is carefully labelled as ‘epub with Kindle values’ or ‘Original Epub’ or whatever works for you. Now go back to the first folder and ‘unpack’ the epub. See my post: how to unpack an epub for instructions. Following those instructions will create a new folder with the various parts of the original epub file inside. This folder will have the same name as your original e-book file. Now you will need to delve into this folder and restructure your html table of contents and then link the html table of contents. Next you need to delete the html cover and then finally link the cover IMAGE. You will also have to delete any <h>tags styled as invisible as described here. Click the links for how tos on all of these. This step is probably the most problematic bit of converting an epub to kindle and took me quite a lot of time to work out how to do it. Once you are finished, you need to re-pack the folder, restoring it to e-pub format, BUT WITH THE NECCESSARY CHANGES for kindle. YOU SHOULD NOT re-open this file with Sigil, because Sigil will not like what you have done to the file and will try to change it back, with unpredictable and probably either inconvenient or catastrophic results. In essence, all you need do is to follow the procedure for unpacking your e-book in reverse order. The results of the various processes will depend a little on your operating system, and so this discussion is deliberately vague about where the files will be created. But I would recommend being methodical about naming and storing your files. The converted e-pub will now be in pieces in a folder somewhere with the same name as the original e-pub. So begin by creating a blank .zip file (archive). In Windows 7, right-click where you want the blank archive and select ‘new ▶ Compressed (zipped) Folder’ from the pop-up menu. Then open the blank archive by double-clicking it. DRAG the various parts of your e-book into the archive: FIRST the mimetype, THEN the META-DATA folder and FINALLY the OEBPS folder. I cannot see a reason why, but it seems to help if the files are zipped in this sequence. This is all you need to do in Windows. On a Mac, you will need to have created a new, blank, archive using BetterZip (or equivalent, see this place in my post on how to unzip an e-pub for details) and, when you have added the various parts of the e-book, save the archive using the ‘save without mac stuff’ option (important). Now you have to change the extension of the archive from .zip to .epub and ignore the warning. The icon for the file should change to the e-pub icon. If you have not done so already, change the name of the file to the filename you want your e-book to have, and you’re done! The e-pub (converted to Kindle) is now ready to send to kindlegen. NB the actual filename is something of a convenience: e-reader software will look in the <metadata> of the file, locate the title and display this, NOT the filename, which can be different. Now get yourself a copy of Kindlegen. You can download Kindlegen from here: http://www.amazon.com/kindlepublishing which is I hope an address which is not going to change. If it does, just google ‘kindlegen download’ and you should get to a download page very quickly. The important file inside is ‘kindlegen.exe’. 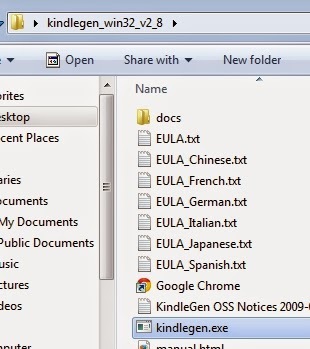 Note the name of the enclosing folder: ‘kindlegen_win32_v2_8’. The version I have on my computer is slightly out of date, you will need the latest one (2.9 at the time of writing). More importantly, the filename of the folder is just ONE WORD with NO SPACES. This matters. The ENTIRE path to kindlegen AND to your e-pub MUST have NO SPACES in any component. In my case, the folder is on the desktop, so the path is: ‘C:\Users\Rod\Desktop\Kindlegen_win32_v2_8’. If you have a user name with spaces in it, then either change it or else create the kindlegen folder on an external drive (say) ‘E:\Kindlegen_win32_v2_8’. Although the file is called ‘kindlegen.exe’, your SHOULD NOT double-click on it to run it. 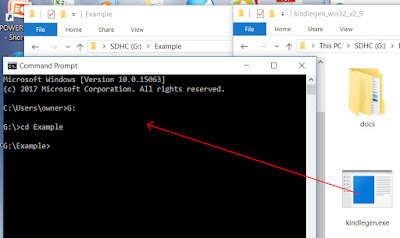 You will need to use the command prompt (Windows) or Terminal (Mac). See here in my earlier post on using epubcheck for instructions on how to access and launch these programs. NB this part of the post has been written quite a bit later then the foregoing and uses kindlegen v2.9 on a Windows 10 machine, rather than Windows 7 which I was using earlier. When I downloaded this new version of Kindlegen, I was a bit worried that it didn’t say ‘Windows 10’ next to the download link. Well, it is a command-line application, and worked just fine on my Windows 10 machine. Type a space after it. Now open the folder with your e-book in it and click and drag the icon for your epub onto the command prompt window in exactly the same way. 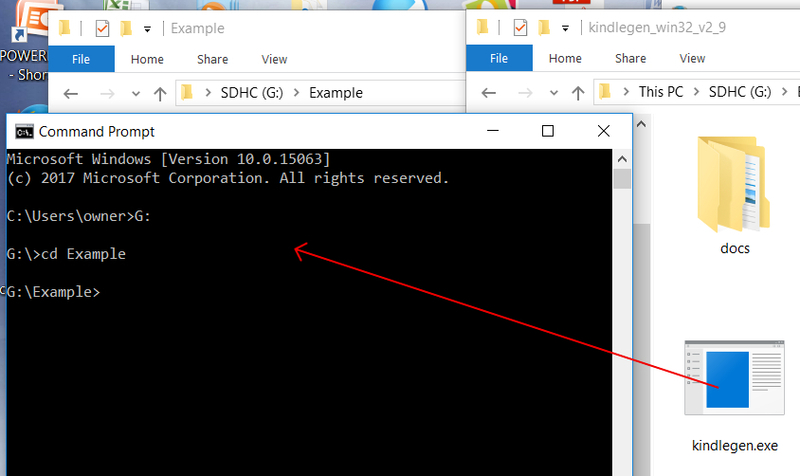 You need to make sure the command prompt is in the front, so click on it to give it focus. The cursor should be blinking. THEN drag the file. Info(prcgen):I1047: Added metadata dc:Title "The Bexhill Missile Crisis"
Info(prcgen):I1047: Added metadata dc:Date "2014-04-07"
Info(prcgen):I1047: Added metadata ISBN "9781904585718"
Info(prcgen):I1047: Added metadata dc:Creator "David Gee"
Info(prcgen):I1047: Added metadata dc:Publisher "Paradise Press"
Info(prcgen):I1047: Added metadata dc:Rights "Worlwide Exclusive"
Info(prcgen):I1040: The document identifier is: "The_Bexhill_Missile_Crisis"
Hopefully the last line will be: ‘Mobi file built successfully’. If there are errors they will be listed. NB I have NOT updated the output from the earlier draft of this post, so notice that the version of kindlegen in the graphic above is 2.8 rather than 2.9. If you have errors and want to save them to a file for reference, you can find a way to do it in this place in my last post. Once you have corrected any errors and built a problem-free mobi file, you can now test it on an actual kindle and with KindlePreviewer. (Kindle previewer is also available from Amazon and emulates all of the different kindles. You can download it from here: http://www.amazon.com/kindlepublishing which is the same place you got kindlegen from.) Once you are happy with it, you can go ahead and upload it to the kindlestore. I would then go back and make a copy of the folder with the original epub file in it and give it a name like ‘published epub’. You can now edit this using Sigil and change the metadata, title page verso and if relevant the back cover barcode to contain the relevant epub values. Don’t forget to run the edited epub through flightCrew and epubcheck one final time just to be sure there are no issues with the file (click the links for details). When it passes both of these, it can be sent off to Apple or Kobo or your wholesaler or uploaded to your website for download or whatever. It is important that you retain a copy of the original epub source file in the folder called ‘epub with kindle values’, or whatever else you decided to call it. Should you want to edit your e-book for some reason, you must make sure BOTH new versions are the same. So start with the original epub source, edit that, reconvert it to kindle and then edit the new epub source to reflect the epub metadata etc. If you do issue an update, do consider having a line on the titlepage verso with something like version 1.1 or whatever. If it is a substantial change, you may need new ISBNs. The process for converting the epub to kindle can be time-consuming. And so you may not want to go back to the epub source and start all over again. If the changes you need to make are very specific, then you could always make them using an html editor. But I would be very careful to get this right. I hope my posts about content.opf will be helpful in this respect. And that is the logical end of this series of posts. I have, inevitably left out some things, and will no doubt think of others. A reference post will follow with all the markup and styles I have used. I will also post on how to embed fonts, even though I do not recommend this, just for the sake of completeness. And I will end the sequence with an introduction! What a great assist these posts have been in guiding a newbie like myself through the more arduous than expected task of building a publishable Kindle ebook from epub/Sigil tools. But it did eventually happen! Found the kdp amazon com/community threads also to be very helpful. Thank you again for these contributions to the self-publishing knowledge base!